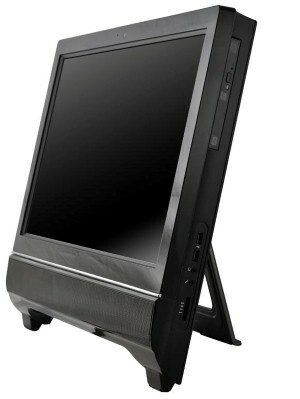 Earlier this week I stumbled across a January PC Magazine story entitled “Build a Touch-Screen All-in-One Desktop.” The star of the story is from EliteGroup (a Taiwanese mega-manufacturer of PCs and parts) known as the G11, a bare-bones compact PC with an integrated 21.5″ touchscreen and lots of other interesting and useful features (check out the PDF specsheet for a nice overview). The upshot of the PC Magazine story is that you can put together a nice Windows 7 touchscreen PC for under $850 by adding your own CPU, memory, hard disk, and slide-in slimline DVD burner. Matthew Murray’s story features the following selection of parts to put that modest system together: ECS G11 ($449), i3-2120 CPU ($117), 2x4GB DDR3 SO-DIMM RAM ($40), 2 TB WD Caviar Black hard disk ($200), and a Lite-On DS-8A5S DVD burner ($33; actual total: $839; today you can get the 2 TB Caviar Green for $120, the memory for $37, and the DVD burner for $24; so today’s price is a nice and low $747). The ECS G11 works with any Sandy Bridge processor whose TDP is 65 W or less. That means the i7 2600S will work, and these i5 items: 2500S, 2500T, 2405S, 2400S, and 2390T. All of the i3 models are rated 65 W TDP. Today’s going price for the quad-core 2.8 GHz 2600S is $310. The ECS G11 can handle 16 GB of RAM, using two 8-GB DDR3 SO-DIMMs. I found some serviceable GeIL units for $99. Instead of an optical drive, I selected a slim-line SATA drive tray to 2.5″ drive enclosure from NewModeus for $42 to accommodate an OCZ Vertex 3 55 GB SSD for an ultra-fast boot drive at $65 (after $15 mail-in rebate), along with a 2 TB Samsung Ecogreen SATA hard disk at $120. Most people who work on PCs want a mouse and keyboard at some point, too, so I picked the Logitech MK710 desktop set for $70. A mini PCI-e 802.11n wireless and Bluetooth combo card adds wireless capability to the unit and goes for $26. When it comes to installation for all this stuff, I refer back to Murray’s PC Mag story, because it includes photographs and step-by-step instructions to put all these part in their proper places — except for the optical to SSD tray install, which requires plugging the drive into the internal SATA connection inside the tray, and then installing the tray just as you’d install the optical drive. The ECS G11 is still priced at $449, so my total top-of-the line budget comes to $1,181. For just over $1,200 you can add in the cost of a portable USB-based optical drive to plug into this unit to write or write CDs or DVDs should you need to (I have two such units already, and suspect many other readers here do as well, which is why I didn’t make it part of my baseline budget, believing that the combination of an SSD for the boot/system drive and a bigger but slower data drive would be much more compelling). I do still have some open questions, though: I’m working to find out if the ECS G11 supports SLAT, which is mandatory to take advantage of Hyper-V support in Windows 8. Ditto for the motherboard’s support for UEFI, necessary to use Windows’s pre-boot malware protection capabilities. I’ll report back as I find out more (I’m trying to get in touch with Elitegroup’s Fremont, CA offices, and have also e-mailed Matthew Murray to see if he knows more than he included in his PC Mag story).